It didn’t take us long to start scoping out the best places to eat, and Boxpark was one of the first we explored. 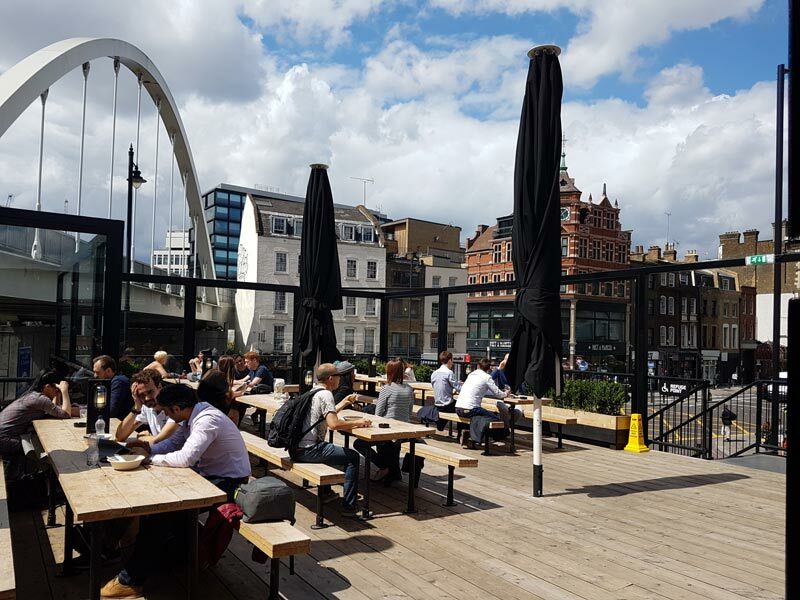 If you’re planning to spend some time checking out this fun and vibrant neighborhood, definitely make some time to check out what to eat at Boxpark in London’s Shoreditch neighborhood for yourself. While you’re in Shoreditch, save time to check out another of our ranking factors to moving here – the fantastic street art! If you’ve not been to London, chances are slim you have any idea what I’m talking about. It’s something of a craze right now in London. There are numerous examples throughout the city where street food vendors come together in one venue that draws major crowds. A great example of this is in its best form is at Borough Market. Boxpark is also one of these venues, but it also brings independent retailers into the mix. Boxpark opened in 2011 in Shoreditch as a popup mall constructed completely out of refitted shipping containers. The ground floor popup businesses open to the sidewalk and are narrow little shops belonging to independent clothing stores, hairdressers, and homeware shops. The second floor is devoted entirely to food and drink. In 2017, Boxpark underwent a makeover that took the sometimes dingy plastic walls away and replaced them with better-looking glass or plastic walls. In the summer, the walls are effectively removed to make an open air space for hanging out, eating and drinking. As you can imagine, I spend most of my time upstairs. The food options are plentiful, from BBQ, to sushi, to Greek and Caribbean food. You can pop into one and have a full meal, or you can hang out in the open area with picnic tables and create a meal from several different stands. In the open area in the center is a bar where people often hang out playing beer pong and chatting with friends. That’s usually where I stand around trying to decide what to eat. Keeping in mind that this is a popup venue, where vendors come and go regularly, here are a few of my current favorites. Check the website to see which vendors are currently operating, to avoid disappointment. If you take a look at the website, you’ll also see that there is a new Boxpark location in Croydon, which is completely outfitted with food vendors. It’s definitely worth it to give the second location a try too. Bukowski has a very small space inside their container with a few tables, so you actually feel like you’re going to the world’s tiniest restaurant. They have burgers and ribs, and a few different beers on tap. All very tasty stuff. A Memphis style BBQ joint, Porky’s has a bit more space inside, and they even have their own bar. It’s a double-wide container, I guess. We ordered a plate of ribs with Mac n Cheese on the side and both were very satisfying to us Americans. Next time I’m going to order the pulled pork sandwich, because YUM. There is often a line at CookDaily when Boxpark is busy. I’m not sure if it’s because it’s incredibly good or because it’s the only vegan place in Boxpark. Either way, it’s a good choice if you’re looking for internationally inspired bowls of goodness. There’s tons of veggies, noodles and tofu packed into each bowl. It’s mostly take out sushi here in plastic trays, the way we’ve come to expect our takeout sushi. There are a few different combos you can pick up depending on your mood. There’s no where to sit inside, but it’s mostly a to-go type place anyway, and there are tables just outside where you can park it if you want. Voodoo Ray’s is actually located downstairs at the front end of Boxpark. It’s pretty tempting when you can see inside the glass doors and there’s a fresh pizza coming out of the oven. They usually have 3-4 different types of pizza to buy by the slice, or you can take a whole pizza (or mix of slices) home with you. It’s a pretty tasty slice of pizza! Another food spot that’s located in the ground floor shops at Boxpark Shoreditch is Dum Dum Donutterie. This place is very well known around here for its freshly baked (never fried) donuts and desserts. They have cronuts. Seriously. If you want to try a really delicious croissant / donut hybrid, you have to come here. Just remember that they sell out often. If you ever find yourself in London, looking for something to do, head directly to Boxpark Shoreditch. You won’t even have to wonder what to eat at Boxpark, because you’ve got it all laid out for you right here. You have to stop by yourself to check out the rest. When we travel, we love to find places like this where we can hang out for a few hours, try the food and have a nice afternoon. I think you’ll find that it’s just the right place for that. And there’s a ton of other stuff to do in Shoreditch when you’re finished eating and drinking! This entry was posted in Things to do and tagged London.